Geotripper: What Lies Beneath Yellowstone? Yosemite, of course! What Lies Beneath Yellowstone? Yosemite, of course! Upper Yosemite Falls, 1,250 feet high. Taken together the three components of Yosemite Falls amount to the fifth or seventh highest waterfall on the planet, at 1,425 feet (depending on who is measuring). Okay, it's more fair to ask "what lies beneath Mt. Rainier or Crater Lake?". Yellowstone National Park sits atop a continental hot spot, and the plume of hot material will either explode out in a violent rhyolite tuff eruption, or cool deep underground into a granitic pluton. 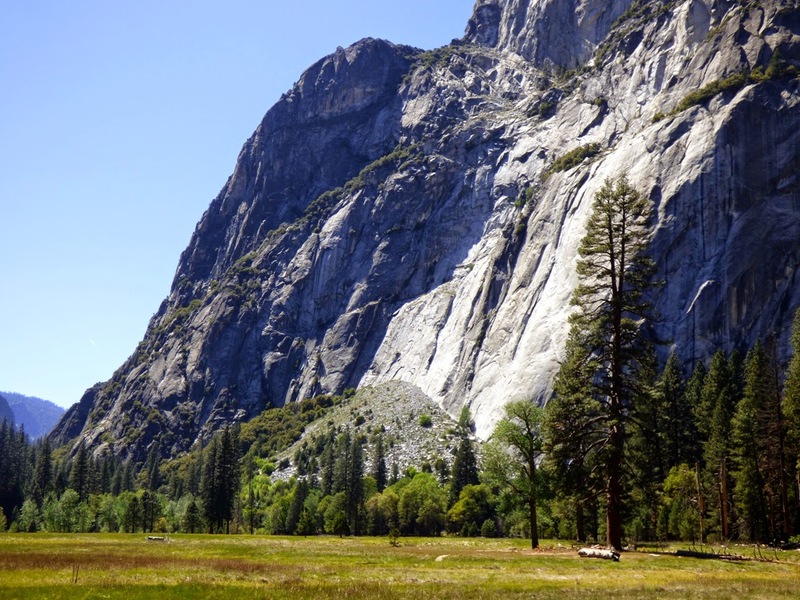 And Yosemite National Park exposes a great deal of granitic rock. 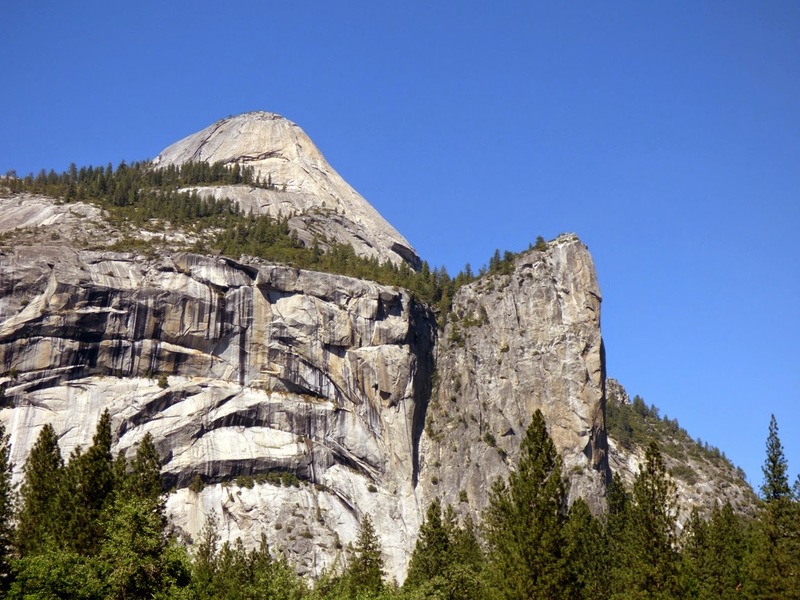 But the origin of the granite at Yosemite is more related to arc magmatism, the formation of volcanic and plutonic rock as a plate of oceanic lithosphere sinks into the mantle beneath the edge of a continent. That's what is happening today in the Cascades, and it's what formed the famous volcanoes of that range: Rainier, Hood, St. Helens, Crater Lake, and more than a dozen others. Lower Yosemite Falls, 320 feet high. Note the people for scale. In a way, today's post is a sneak preview of the ending portion of my certain blog series on "Driving Through the Most Dangerous Plate Boundary in the World". The Franciscan subduction zone that was active during the Mesozoic Era was responsible for forming the Sierra Nevada batholith (batholith is a term for large bodies of magma, or a combination of numerous plutons in a region). The neat thing one can consider when visiting a Sierra Nevada park like Yosemite is that not only are you standing on the underside of former volcanoes and calderas, but you can also imagine the dinosaurs that once tromped around on the slopes of said volcanoes (we have even found fossils of a few of them, down in the sediments of the Great Valley)! The Cathedral Rocks. Bridalveil Falls lie hidden on the other side. I was in the valley again on Saturday, working through the onerous chore of dragging students around on a geology field trip. Somebody has to do it, after all. Buses can only stop in a couple of places around the valley floor, so we got off the bus and used the valley tram system to make a series of appointments at several spots in the valley to discuss the very cool geology. Given a choice, I usually fore-go the tram in favor of walking to the appointment spots. It's not that I don't like the trams; they make a big difference in traffic congestion on the valley floor (you think it's crowded today? Imagine all the people on the trams in individual vehicles...). But because the trams make around thirty stops while traveling the loop of 8 or 9 miles, I can progress as fast or faster on foot. So I hoofed it from Yosemite Lodge to Happy Isles, a distance of about four miles. I had an hour and twenty minutes to get there, and I arrived with not a second to spare. But I saw marvelous sights along the way! Yosemite Falls was at what may be the best flow it will have all year (top two photos). The drought left the park with 5% of its normal snowpack, and much or most of the ice is already flowing down the creeks and rivers. 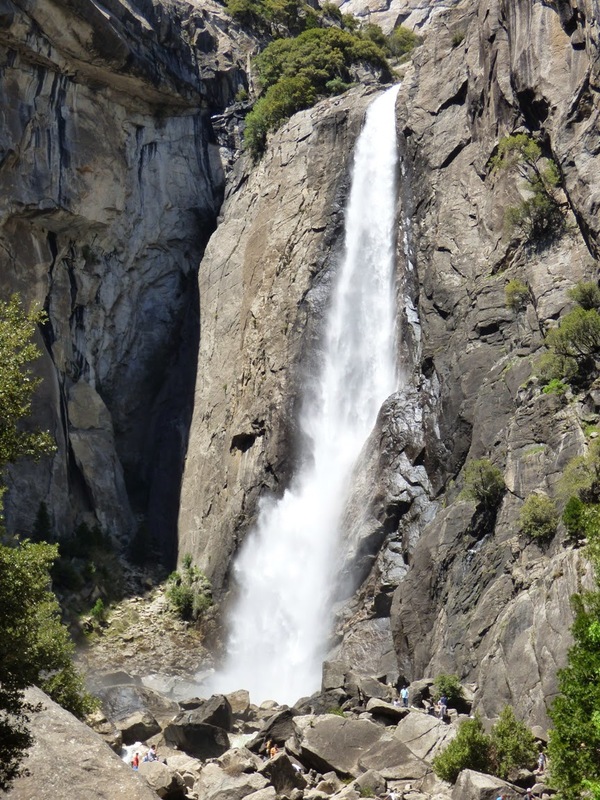 The falls will be dry in early summer. 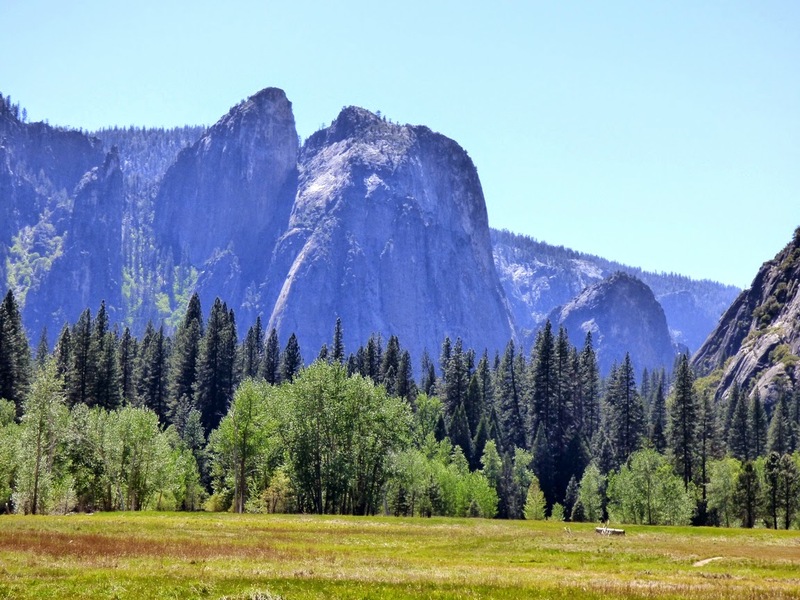 I walked south from Yosemite Lodge where I had some very nice views of the Cathedral Rocks and the Middle Brothers Slide. The slide took place in 1987, and was the largest slope failure in Yosemite's recorded history, with over a million tons of rock. Washington Column, the Royal Arches, and Clouds Rest make for an awesomely steep gorge from the perspective of Swinging Bridge. The Bridge doesn't swing anymore, darn it! 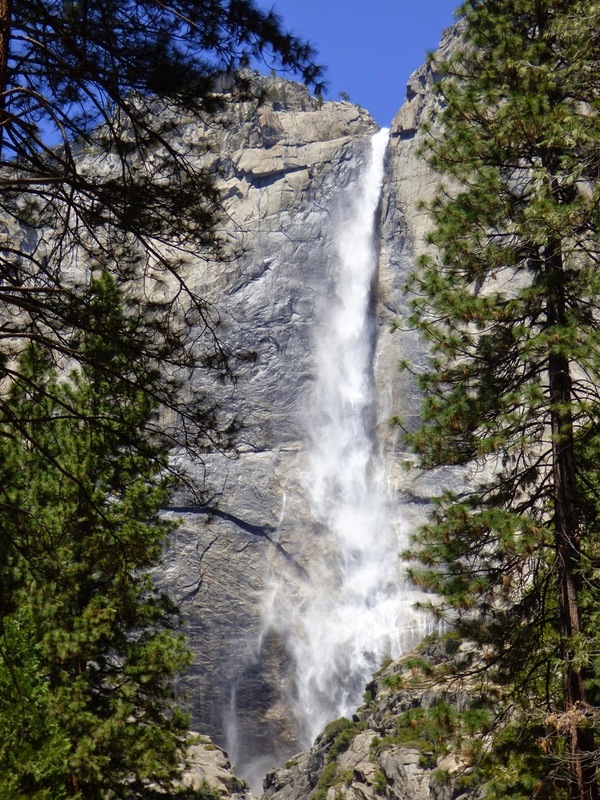 But it makes a nice platform for viewing Yosemite Falls and Yosemite Point from some distance away. 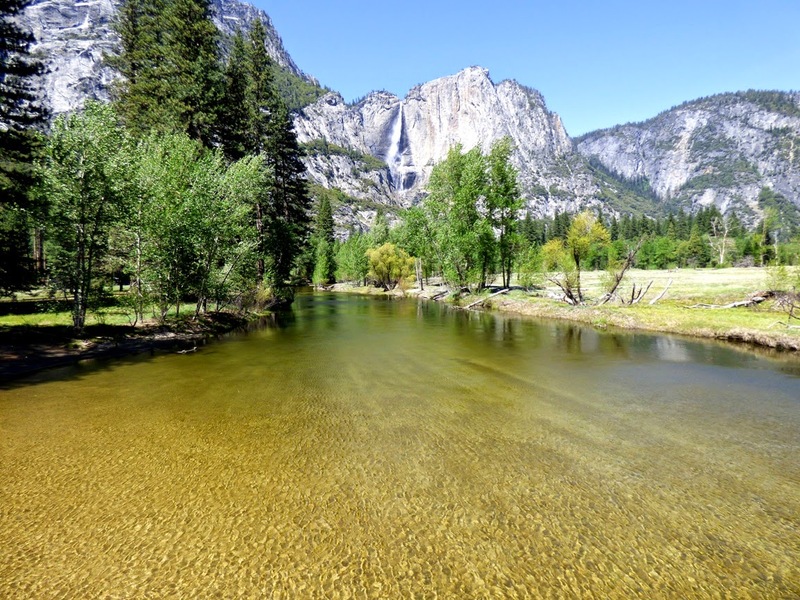 The Merced River should be a bit more riotous at this time of year. I added one small new section of trail to my experience this day. 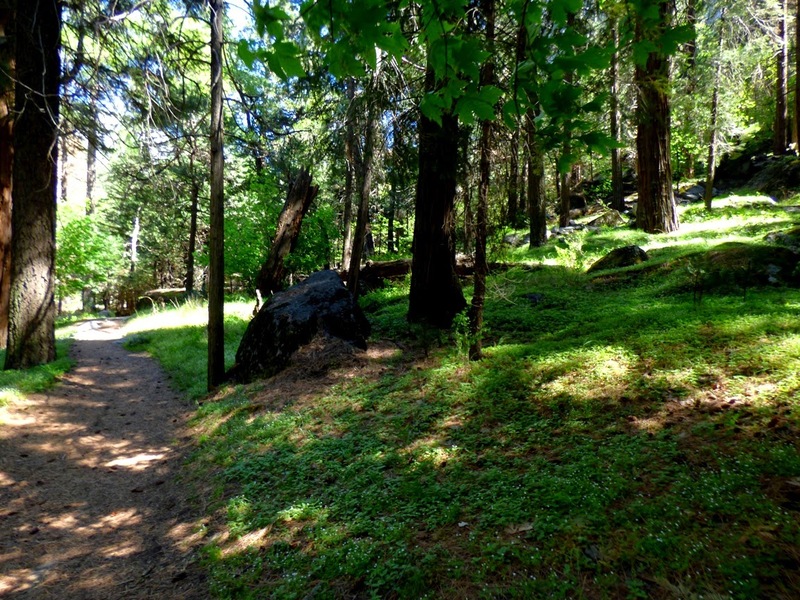 The Yosemite Loop trail travels the length of the valley on both sides, and I have walked most of it, but the section from the chapel to the LeConte Memorial Building was new to me. Despite the dry conditions, the forest floor was green and bursting with small white flowers. From the south side of the valley, Washington Column stands as a bold cliff like the prow of a mighty battleship. It is shaped by joint fissures, large vertical cracks formed when the rock was exposed by erosion and expanded. North Dome, high above the Column, was formed by a similar process called exfoliation, where the rock expanded outwards, breaking off slabs that are parallel to the surface of the rock. 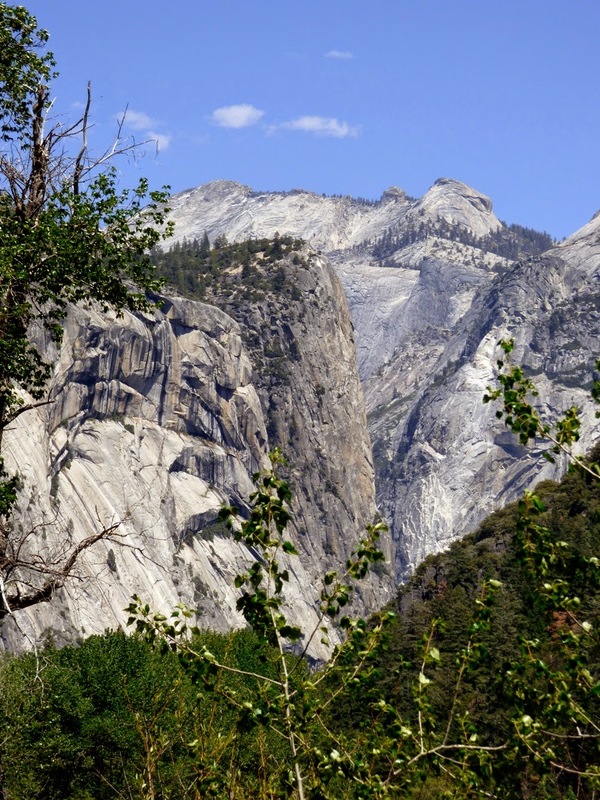 The process tends to form domes all across the Sierra without the action of glacial erosion. The slabs formed by exfoliation can be dangerous to humans. In 1996, a slab the size of a football field came off the valley rim near Glacier Point, and collapsed on the valley floor near Happy Isles. The rocks killed one person and severely injured another. I was racing to the appointment at Happy Isles to show the students the site. It was a beautiful day on the valley floor, and it was the first time some of my students had ever visited the park. That is one of the great privileges I have as a teacher of geology, introducing them to such a wonderful place, and providing an in-depth story explaining how the place came to exist. And dinosaurs!